At the age of 8 or 9 years Fred Mooers Mother Died: His father Levi Mooers has to work away, and so, Fred Mooers was to live with a Charlie Woodman. Thank you God for looking after him. 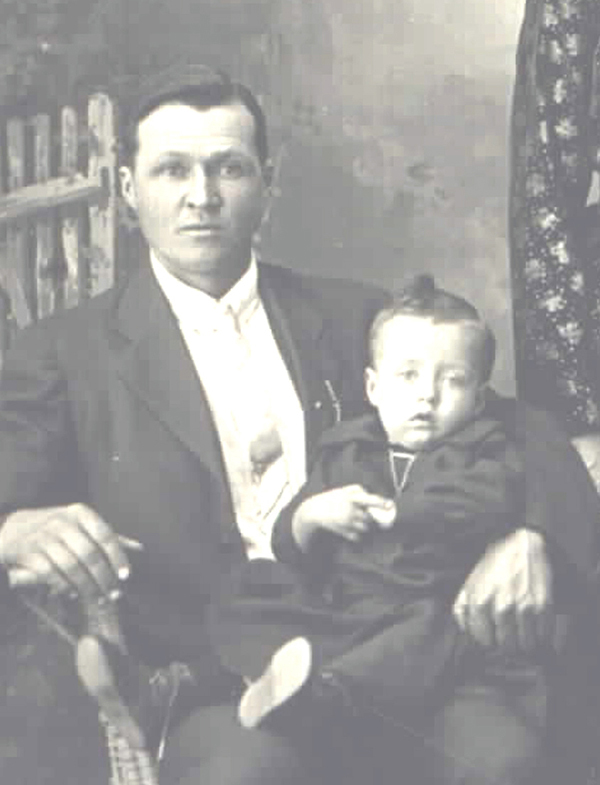 Frederick Levi Mooers holding his son Lee H. Mooers. United Empire Loyalist. I am told of Dutch Descent by Aunt Isabelle Grant, but have seen no documentation. When I searched for this name in the United States, most names appearing in his timeframe were on: Palmer Center Cemetery Palmer, Hampden County, Massachusetts MOOERS, Capt. Jonathan, Sep 26, 1852, 63yrs MOOERS, Jona, Feb 13, 1834, 85yrs MOOERS, Mary, d/o Capt Jona & Sally, Dec 10, 1817, 10yrs MOOERS, Mary, w/o Jona, Oct 23, 1834, 91yrs MOOERS, Sally, w/o Capt. Jona, Oct 24, 1847, 60yrs, would any of these be his people?...i wonder? Other names for Mooers is Nantucket and Martha's Vinyard. Possibly from there originally. There are marney's located there too. I never knew my grandfather, as he was deceased by the time I was born, by one year. I have been told by many, that he was as strong Christian and read his Bible a lot. May God grant, "blessed to the 7th generation". And the circle starts again. Ada MacFarlane Born Feb 3rd, 1889. married Frederick Levi Mooers. Picture taken age 16 years. SCOTTISH DESCENT. Ada Blanch (e) Mooers, is the daughter of Thomas Henry MacFarlane (1884-1919) ae 75 and Sophia (nee Briggs) 1851-1932 Ae 81.